Relatively little is known about the factors that induce people to become inventors. Using data on the lives of over one million inventors in the US, this column sheds light on what policies can be most effective in increasing innovation. In particular, it shows that increasing exposure to innovation among women, minorities, and children from low-income families may have greater potential to spark innovation and growth than traditional approaches such as reducing tax rates. Innovation is widely viewed as the engine of economic growth (e.g. Aghion and Howitt 1992, Romer 1990). As a result, many policies have been proposed to spur innovation, ranging from tax cuts to investments in STEM (science, technology, engineering, and mathematics) education. Unfortunately, the effectiveness of such policies is unclear because we know relatively little about the factors that induce people to become inventors. Who are America’s most successful inventors and what can we learn from their experiences in designing policies to stimulate innovation? We study the lives of more than one million inventors in the US using a new de-identified database linking patent records to tax and school district records (Bell et al. 2017). Tracking these individuals from birth onwards, we identify the key factors that determine who becomes an inventor, as measured by filing a patent.1 Our results shed light on what policies can be most effective in increasing innovation, showing in particular that increasing exposure to innovation among women, minorities, and children from low-income families may have greater potential to spark innovation and growth than traditional approaches such as reducing tax rates. Our analysis yields three main lessons. 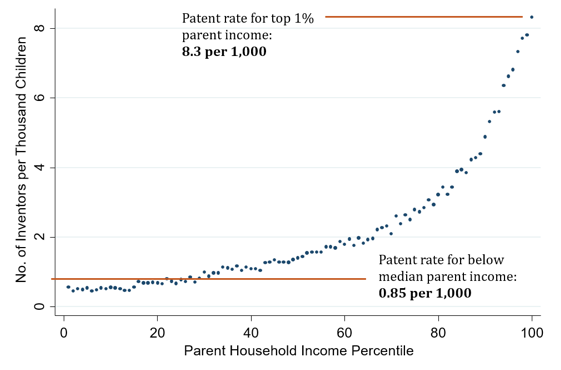 Children with parents in the top 1% of the income distribution are ten times more likely to become inventors than children with below-median income parents (Figure 1). There are analogous gaps by race and gender: white children are three times more likely to become inventors than black children and only 18% of inventors are female. The gender gap in innovation is shrinking gradually over time, but at the current rate, it will take another 118 years to reach gender parity. Differences in ability, as measured by test scores in early childhood, explain very little of these disparities. 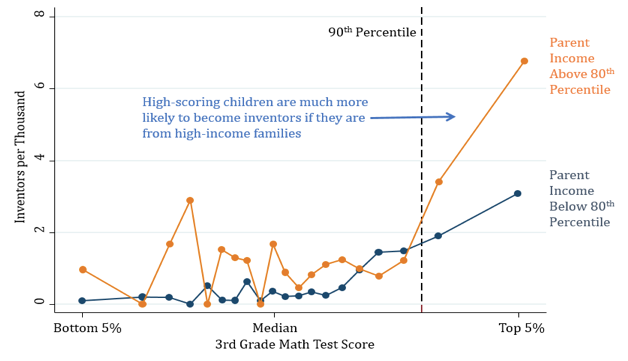 Children at the top of their 3rd grade mathematics class are much more likely to become inventors, but only if they come from high-income families (Figure 2). High-scoring children from low-income or minority families are unlikely to become inventors. Put differently, becoming an inventor relies upon two things in America: excelling in mathematics and science and having a rich family. The gap in innovation explained by test scores grows in later grades; by 8th grade, half of the gap in innovation by income can be explained by differences in test scores. This is because low-income children steadily fall behind their high-income peers over time, perhaps because of differences in their schools and childhood environments. We next turn to analyse what specific environmental factors contribute to these disparities. Children who grow up in areas with more inventors – and are thereby more exposed to innovation while growing up – are much more likely to become inventors themselves. Exposure influences not just whether a child grows up to become an inventor, but also the type of inventions he or she produces. For example, among people living in Boston, those who grew up in Silicon Valley are especially likely to patent in computers, while those who grew up in Minneapolis – which has many medical device manufacturers – are especially likely to patent in medical devices. Similarly, children whose parents hold patents in a certain technology class (e.g. amplifiers) are more likely to patent in exactly that field themselves rather than in other closely related fields (e.g. antennas). Notes: Darker colors denote areas where more children grow up to become inventors. The five cities that produce the most inventors per capita in America are highlighted. Exposure matters in a gender-specific manner. Women are more likely to invent in a given technology class if they grew up in an area with many female inventors in that technology class. Growing up around male inventors has no impact on women’s propensity to innovate. Conversely, men’s innovation rates are influenced by male rather than female inventors in their area. Our findings are consistent with recent evidence that exposure to better neighbourhoods in childhood improves children’s life outcomes. Neighbourhood effects have typically been attributed to factors such as school quality or residential segregation. Since it is implausible that some neighbourhoods or schools prepare children to innovate in a single field, such as amplifiers, the exposure effects here are more likely to be driven by mechanisms such as mentoring, transmission of information, and networks. Children from low-income families, minorities, and women are less likely to have such exposure through their families and neighbourhoods, helping explain why they have significantly lower rates of innovation. For example, our estimates imply that if girls were as exposed to female inventors as boys are to male inventors, the gender gap in innovation would fall by half. The average patent holder earns approximately $256,000 per year in his or her mid-forties. But the individuals who make discoveries that have the greatest scientific impact – i.e. those who produce the most highly-cited patents – earn more than $1 million on average per year (Figure 4). Scientific progress is largely driven by a few star inventors who are highly compensated for their work by the market. Women, minorities, and individuals from low income families are as under-represented among star inventors as they are among inventors as a whole. Given our finding that innovation ability does not vary substantially across these groups, this result implies there are many ‘lost Einsteins’ – people who would have had high-impact inventions had they become inventors – among the under-represented groups. These findings suggest that changes in financial incentives (e.g. by reducing tax rates) have limited scope to increase innovation, for two reasons. First, changes in incentives affect only the small subset of individuals who have exposure to innovation. Second, such policies are unlikely to influence the decisions of star inventors who matter most for economic growth. Star inventors – who typically earn more than $1 million per year – would presumably be happy to work in their field even if they earned say $950,000 instead of $1 million per year.3 We caution, however, that these predictions remain to be tested empirically and that taxes could potentially affect economic growth through other channels, for instance by changing the behaviour of firms or other workers. If women, minorities, and children from low-income families were to invent at the same rate as white men from high-income (top 20%) families, the rate of innovation in America would quadruple. Our findings therefore call for greater focus on policies that harness the under-utilised talent in these groups by providing them greater exposure to innovation. Such policies could range from mentoring programmes to internships to interventions through social networks. Our analysis does not tell us which programs are most effective, but it does provide some guidance on how they should be targeted. Targeting exposure programmes to children from under-represented groups who excel in mathematics and science at early ages is likely to maximise their impacts. Furthermore, tailoring programmes to participants' backgrounds may be valuable: for example, women are more influenced by female rather than male inventors. More broadly, our results suggest that improving opportunities for disadvantaged children may be valuable not just to reduce disparities but also to spur greater innovation and growth (Aghion et al. 2017). Aghion, P, U Akcigit, A Hyytinen and O Toivanen (2017), “The Social Origins of Inventors” Centre for Economic Performance Discussion Paper 1522 (see also the Vox column here). Bell, A, R Chetty, X Jaravel, N Pektova and J Van Reenen (2017), “Who Becomes an Inventor in America? The Importance of Exposure to Innovation”, The Equality of Opportunity Project. Romer, P (1990), “Endogenous Technological Change”, Journal of Political Economy 98(5): S71-S102. Not all patents are meaningful new inventions; however, we show that focusing on the subset of patents that have the most substantial scientific impact, as measured by future citations, generates very similar results to those discussed below. This result also weighs against the hypothesis that a lack of access to funding or an aversion to risk discourage low-income students from pursuing innovation, as those factors would generate gaps in innovation rates even among students attending the same college. Even if people are uncertain about their chances of becoming a star when deciding whether to pursue innovation, tax changes are unlikely to have large effects. The payoffs to innovation are similar to a buying a lottery ticket. Most of the time one doesn’t win (in which case tax rates don’t matter), but sometimes one hits the jackpot and wins millions (in which case a slightly smaller payout won’t reduce interest in buying a ticket by much).